Tag line: "Sail the high seas. Battle the pirates. Live the adventure"
Yet another adaptation of Robert Louis Stevenson's timeless adventure story, Treasure Island is told from the perspective of Jim Hawkins (Christian Bale), a young boy serving aboard the Hispaniola, a ship bound for a place called “Treasure Island”. According to the map that once belonged to the drunken "Captain" Billy Bones (Oliver Reed), this is where the late pirate Flint supposedly buried a fortune in gold and jewels. But aside from a few honest men, including Dr. Livesey (Julian Glover), Squire Trelawney (Richard Johnson) and Captain Smollett (Clive Wood), the entire crew of the Hispaniola is made up of pirates, who are waiting for their chance to take control. Led by Long John Silver (Charlton Heston), the brigands plan to seize the ship the moment the treasure is on-board. But thanks to Jim, who’s gained Long John’s trust, their devious plot is revealed, leading to a stand-off that neither side is prepared to face. One can’t discuss this made-for-TV movie without mentioning its all-star cast. Oliver Reed seemed the natural choice to portray Billy Bones, the gruff, hard-drinking former pirate who gives the treasure map to young Jim Hawkins, and Christopher Lee has a brief but effective appearance as Blind Pew, one of Flint’s men who come looking for said map. Having grown accustomed to seeing Charlton Heston play the hero, which he did in a number of epic films (Ben-Hur, El-Cid, The Ten Commandments), his turn as the treacherous Long John Silver was a nice change of pace, and he's damn good in the part. While Heston does, at times, come across as a likable foe (due mostly to the friendship he forges with Jim), there’s enough of a scoundrel left in his Silver to make him a dangerous adversary. As for the honest men, Richard Johnson is at his best as the boisterous Squire who, on occasion, allows greed to cloud his judgment; and Julian Glover’s Livesey is, at all times, the perfect gentleman. Then there’s the Dark Knight himself, Christian Bale, who, though only 15 when Treasure Island was produced, manages to hold his own alongside the film’s more experienced stars. 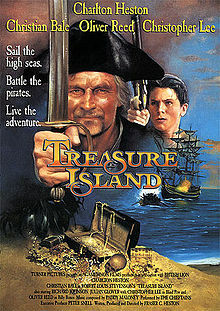 Directed by Heston’s son, Fraser, Treasure Island makes great use of its various settings (aside from the scenes that take place at sea, portions of the movie were shot on-location in Cornwall and Jamaica). This, plus the convincing period costumes and tremendous performances, helps bring Stevenson’s literary classic convincingly to life.